Kiri was born in East Anglia in 1975. She grew up on the Essex coast spending a lot of time in local nature reserves, much of it in wellies pond-dipping in the rain, exploring the natural beauty of the region's countryside that has become her inspiration. She also frequently visited the north Norfolk coast, which remains one of her favourite places to this day. Her longstanding passion for nature and wildlife was reawakened when she moved to a small South Oxfordshire village near the historic Ridgeway national trail. She discovered digital photography after receiving a Canon DSLR as a birthday present from her husband. The medium proved to be the perfect outlet for her creative streak and she has been combining her love of the natural world with a passion for photography ever since. Creatively, Kiri's photography combines a eye for colour and form with a love of "real" natural history and telling a story through reportage. She has a fascination for oft overlooked little details that evoke the genuine beauty of the world around us. Most of her images are photographed in local countryside lanes footpaths and nature reserves where she lives. She has also travelled further afield, most notably visiting Finland to photograph European grey wolves and brown bears in the wild. Kiri is passionate about conservation, she volunteers for Norfolk Butterfly Conservation and is a strong advocate of animal welfare Her photography ethics follow the principle of non interference and first do no harm. The safety and well being of wildlife, even insects, always comes first. In 2012 Kiri returned to East Anglia and settled in a small mid-Norfolk village, where she continues to explore the everyday natural world around us through close up, macro and landscape photography. In her spare time she enjoys walking her beloved rescue collie Star on North Norfolk's beautiful beaches and working on her large wildlife garden. 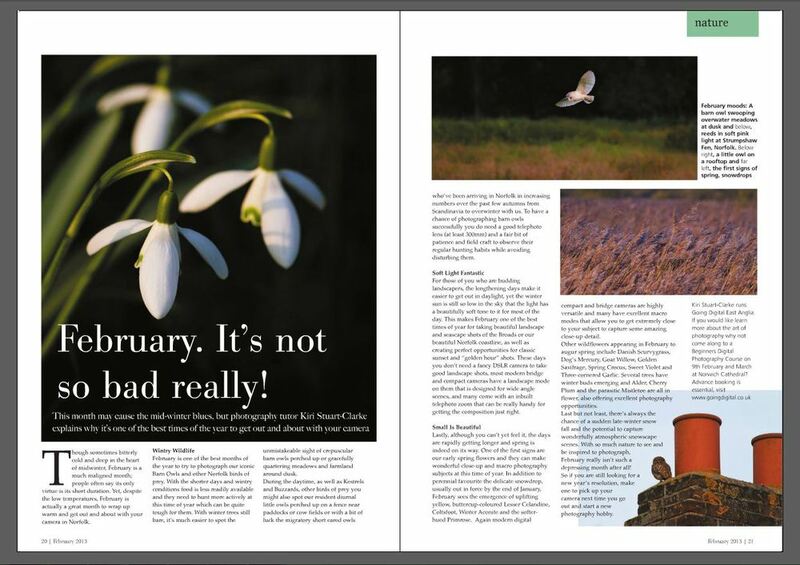 Kiri has written numerous articles on nature and wildlife gardening themes, illustrated with her own photography in a range of magazines and publications. If you would like to commission a feature article or use any of my images please contact me. When out and about with my camera and lenses I'm often asked what photography equipment I use. Two old adages hold true; the most important piece of kit is first and foremost "the photographer's eye" and much can be achieved with modest equipment used within its constraints, especially with today's technological advances. Truest of all is the saying that "the best camera is the one you have with you" when the opportunity suddenly appears and you really need it! Rare is the photographer who doesn't have at least one tale to tell of "the image that got away".